Department of Environmental Protection (DEP) Commissioner Vincent Sapienza and Department of Design and Construction (DDC) Commissioner Lorraine Grillo updated homeowners and businesses in southeast Queens on the de Blasio Administration's historic commitment of $1.9 billion to build a comprehensive drainage system and alleviate flooding in neighborhoods throughout the area. Thus far, roughly 20 percent of the funding has been committed to 10 completed projects and another 10 that are currently under construction. An additional 25 projects are currently in the planning and design phase and will break ground in the coming years. Neighborhoods receiving upgraded drainage systems include St. Albans, Rosedale, Jamaica, Laurelton and Springfield Gardens, amongst others. 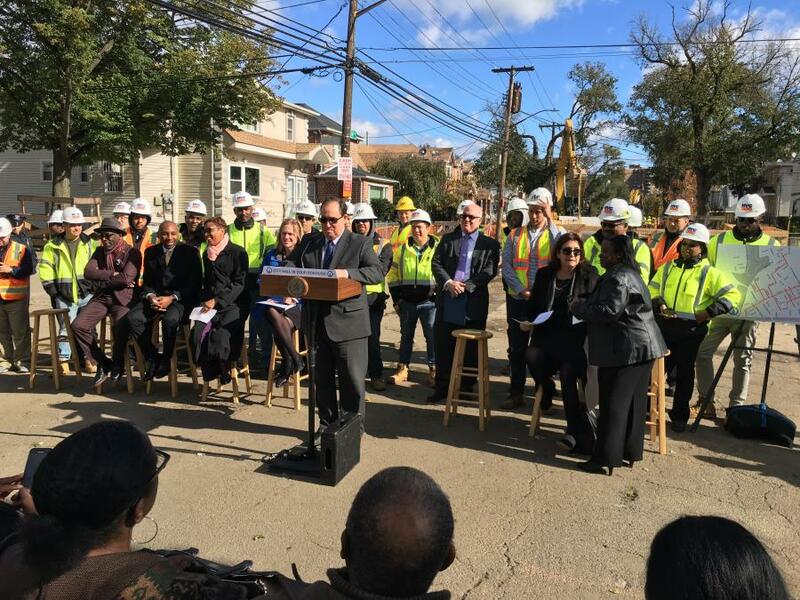 "Shovels in the ground in southeast Queens mean we are one step closer to a true drainage system and some peace of mind for residents and businesses," said Sapienza. "As we complete each of these projects we will see better drainage, safer roadways, a healthier Jamaica Bay and higher property values across these long-underserved neighborhoods." "Many parts of southeast Queens experience significant flooding and ponding issues that can linger for days after a heavy rainfall," said Grillo. "We're very happy to enjoy the support of the Mayor and to work with our partners at DEP to implement the largest systematic street restoration program in the five boroughs." The bulk of the funding will go towards the construction of large trunk sewer spines along 150th Street, Guy Brewer Boulevard, Farmers Boulevard and Springfield Boulevard. The first of those projects recently broke ground. 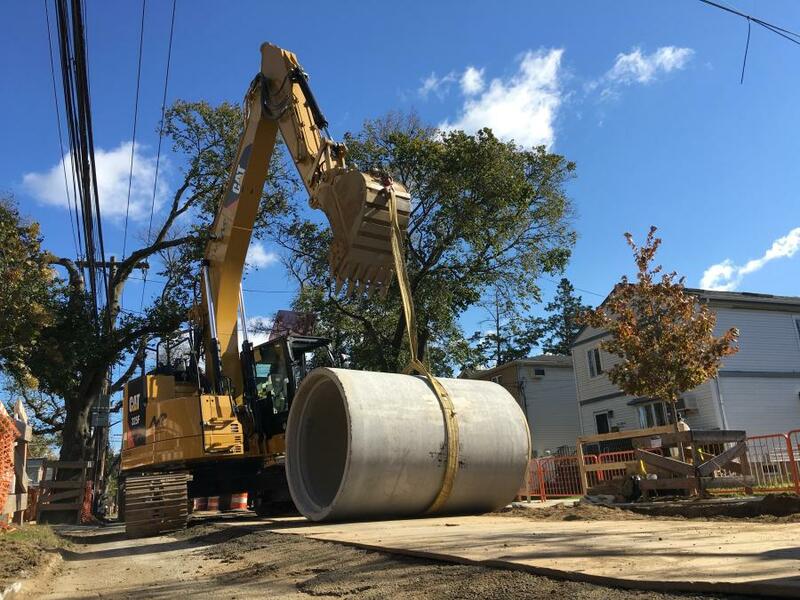 Dozens of local sewer projects will connect neighborhoods to the trunk sewer spines. Bluebelts also are being constructed to help manage stormwater at Springfield Lake, Baisley Pond, Twin Ponds and Brookville Triangle. Funding also is going towards projects that can deliver flooding relief more quickly than the large sewer construction projects. This includes smaller sewer extensions to relieve flooding on a block-by-block basis, and the addition of green infrastructure along roadways and at city schools, playgrounds and at NYCHA facilities. The buildout of the drainage system in southeast Queens is a collaboration between DEP, DDC and DOT. As part of the Rochdale project, where the Commissioners joined with elected officials to update homeowners and businesses, more than 1550 ft. of storm sewers will be installed and an additional 6,600 ft. of storm sewers will be replaced with new, larger pipes, some as large as 66 in. in diameter. Up to 11,000 ft. of old sanitary sewers will be replaced, in many locations with larger sanitary sewers ranging up to 36 in. in diameter. To further improve street drainage, 44 new catch basins will be installed and 87 existing ones will be replaced. 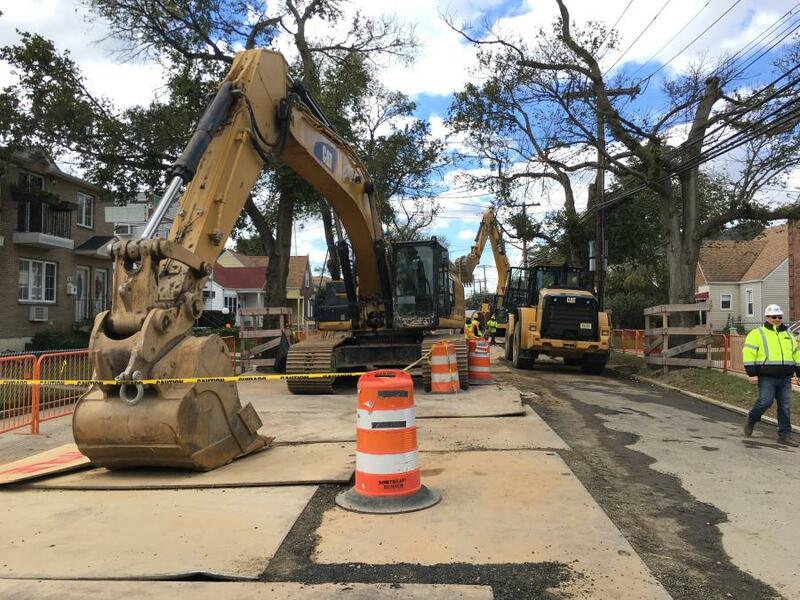 The project also will see the replacement of 18,000 ft. of old cast iron water mains, some dating back to the 1920s, that were installed by the Jamaica Water Supply Company. Additionally, 16 new fire hydrants will be added to the area and 32 older ones will be replaced with new ones. It is anticipated that the project will be completed in 2020.